Security will be even more of an issue. Learn to deal with it. Hard to believe, isn't it given all the issues we've seen in the past year? Everyone (especially if you are thinking about running for president) must learn to deal with this issue which will impact both on-premises and cloud computing. As we've seen, anything on a network is not immune. This will only get worse with bigger DDOS attacks, more sophisticated hacks and intricate state-sponsored breaches. It's up to all of us to figure out how to protect ourselves, or risk paying the price. Lock down your e-commerce and web presence with dual-factor authentication, intrusion detection, etc. Get partners with specific expertise to help you. And whatever you do, don't host email servers in your closet! As we saw in the presidential election, you are not equipped to protect them. Regulatory compliance becomes table stakes. Driven by all the risks, enterprises will only deal with entities that are certified to host their data. Examples of regulatory compliance laws and regulations include the Payment Card Industry Data Security Standard (PCI DSS) , Health Insurance Portability and Accountability Act (HIPAA), and the Federal Information Security Management Act (FISMA). The number of rules has increased dramatically as a consequence of the various high-profile and under-the-radar breaches with regulatory compliance becoming more prominent in a variety of organizations. Chief Security Officers, and regulatory, compliance officer positions will emerge and gain prominence to ensure enterprises conform to complex regulations and mandates. Public cloud momentum will shift to hybrid cloud momentum. Two factors will drive the uptake in hybrid cloud consumption versus public cloud as we start seeing the chinks in the AWS armor. The first one is the aforementioned security issue, which will force some people to want to control their own destiny and make them pause from moving all their workloads to the public cloud. The second is cost as companies scrutinize their overall spending with the AWS cloud and re-think their approach to a more hybrid solution. That allows them to leverage both in a balanced and rational manner. Hybrid goes a long way to resolving security concerns and helps take workloads out of expensive public clouds where that makes sense. Amazon will spin off AWS. Given the size of Amazon's cloud business and the fact that it is an entirely different business from its online shopping, the parent will spin off AWS as a separate entity. Amazon will also come under anti-trust scrutiny for potential monopolistic behavior which will drive the spinoff. This will be good for Amazon, and the internet. Managed services continues to grow while Rackspace will start to further fade away into the sunset. This, I believe, is the maturing of what we know as cloud computing. Adding my previous predictions leads to the certainty that hybrid cloud will really emerge in the year ahead - and with it, growth in managed services layered on top of public, private and dedicated cloud. The need for managed services to wrap around hybrid cloud implementations to meet the specific requirements of the enterprise will become more prevalent as IT departments get further stretched, and regulatory compliance becomes more of a necessity. Unfortunately, Rackspace, which single-handedly created this space, will continue to fade under its new ownership after the departure of all the brain power that founded and made the company what it is today. Net neutrality will get reversed. The incoming administration will want to loosen regulations, plus it will have the backing of a Republican Congress, and we will see several of the current net neutrality FCC rules go away thus limiting government involvement and allowing free market to decide on the best course of action. Small start-ups have led the way here teaching everyone the benefits of continuous integration and automation. That trend continues to "trickle up" to medium-size businesses, and enterprises as DevOps practices take hold. The deluge of data accelerates and overwhelms the unprepared. As Big Data and the Internet of Things projects come onstream, the amount of data requiring storage, security and processing speed escalates to never-seen-before levels. I think 2017 is the tipping point for IoT, which moves into the mainstream. These technologies have both been around awhile now and long enough for people to figure out how to make them work and, importantly, meet realistic expectations. But, potentially the technological bottleneck will become the deluge of data that overwhelms infrastructure which is not able to scale due to poor or dated architectures. Luck will always favor the prepared! Have a great and prosperous 2017! 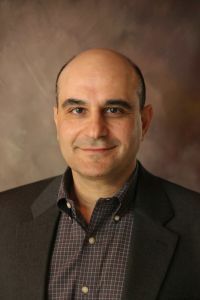 Emil Sayegh is the CEO and president of Hostway, a global leader in cloud and managed hosting - serving 500,000 customers ranging from SMBs to Fortune 500 companies. Prior to joining Hostway, Emil was the CEO and chairman of Codero Hosting, vice president of cloud computing at HP, and general manager and vice president of the cloud division at Rackspace.